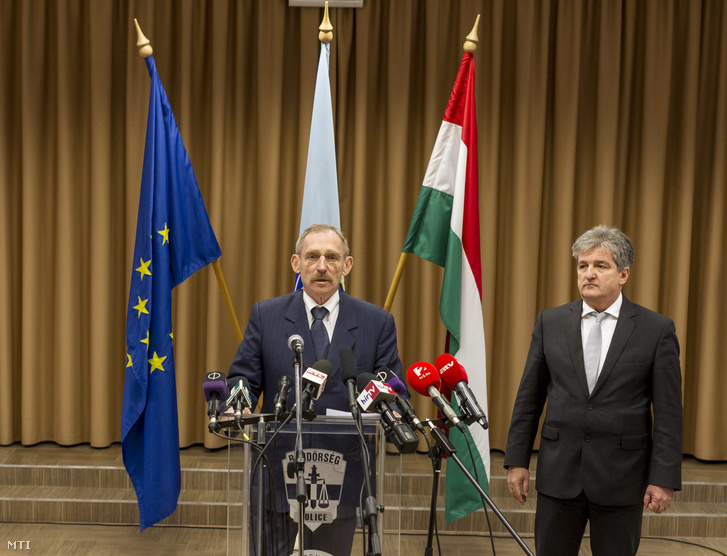 Interior Minister Sándor Pintér (left) and Interior Ministry State Secretary László Tasnádi hold a press conference on November 27, 2015 (photo: MTI). On November 24, 2015, Chief Director János Hajdú of the Orbán Government-founded Counter Terrorism Center (TEK) announced that the SWAT-secret service organization had arrested six people on consecutive days traveling in two motor vehicles carrying automatic weapons and explosives. Hajdú said that TEK had found a “genuine bomb laboratory” during a subsequent search connected to the arrests, claiming that “the possibility that the group operating the bomb laboratory belongs to a terrorist organization cannot be excluded” and that “two individuals who may have been part of extremist circles were likely on the threshold of an operation and the chances of misuse of firearms was great.” Hajdú revealed that the cases had an “international thread” (nemzetközi szál), noting that two of the people that TEK had arrested were foreign nationals (see The Dubious Plot). On November 26, an official from the Budapest Chief Prosecutor’s Office announced that the Budapest Central District Court had ordered that two of those arrested be held in custody on charges of “misuse of firearms and ammunition” (source in Hungarian). Ordnance on display during the Pintér-Tasnádi press conference (photo: MTI). On November 27, Interior Minister Sándor Pintér and Interior Ministry State Secretary László Tasnádi held a joint press conference during which the latter asserted that the two suspects who remained in custody had wanted to “execute” (kivégezni) a member of the Orbán Government. Interior Minister Pintér specified that the two groups of suspects that TEK had arrested were not affiliated with one another, charging that journalists had “muddled” the two incidents because “they wanted to misinform the public” (source in Hungarian). Pintér said that TEK had arrested the two suspects still in custody after monitoring communications in which one of them said “it is necessary to persuade the present leaders to give up their power. Of course persuasion can come in the form of a piece of lead in the head” (source in Hungarian). 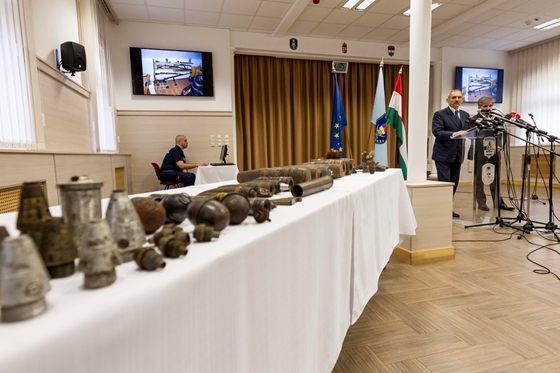 Pintér and Tasnádi held the press conference alongside a large display of old shells, grenades and bullets, which a police bomb-disposal specialist revealed only after the interior ministry officials had left the podium were unrelated to the relevant cases (source in Hungarian). Later on November 27, the tabloid Blikk, the most popular daily newspaper in Hungary, reported without citing its source that “The two men that a court ordered held in custody last week wanted to kill Prime Minister Viktor Orbán.” According to Blikk, the men belonged to an extremist organization called the Hungarian National Army (Magyar Nemzeti Hadsereg) and were both over sixty years old (source in Hungarian). Prime Minister Orbán’s press secretary, Bertalan Havasi, refused to comment on the Blikk report (source in Hungarian). The events surrounding the Counter Terrorism Center’s arrest of six men in motor vehicles carrying weapons and explosives in late November raise many questions: when TEK Chief Director Hajdú revealed that the cases had an “international thread” and that two of those arrested were foreign nationals, who turned out to be Hungarians from Slovakia, why did he not specify that there was no evidence indicating that they were Islamic terrorists? ; on what grounds did Hajdú assert that the suspects “were likely on the threshold of an operation”? ; on what grounds did Interior Ministry State Secretary László Tasnádi claim that the suspects who remain in police custody wanted to “execute” a government member? ; why did the Budapest Central District Court order that these two suspects be held on charges of misuse of weapons rather than attempted murder if there is proof that they intended to kill a member of the Orbán government? ; why did Tasnádi and Interior Minster Sándor Pintér hold a press conference next to several tables displaying shells, grenades and bullets that had nothing to do with the arrests? ; who was the source of the information in the Blikk report claiming that the suspects wanted to assassinate Prime Minister Orbán? ; and why have authorities released no more information about the arrests over the past ten days?